Go to original pattern for design DROPS 64-15. DROPS Sweater with large collar in 2 strands Alpaca Bouclé. 700-750-800 g col. no 0100, off white. 50-50-50 g col. no. 19, light gray. 50-50-50 g col. no. 18, pearl gray. 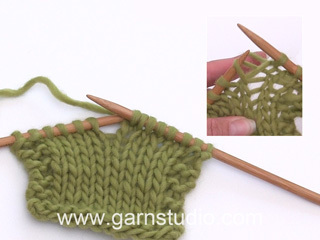 DROPS 6 mm [US 10] needles and double pointed needles, or size needed to obtain correct gauge. Gauge: 10 sts x 17 rows with Big Bouclé in stockinette st = 10 x 10 cm [4" x 4"]. Front: Cast on 58-63-66 sts with 2 strands Alpaca Bouclé and knit 4 rows garter st. Change to stockinette st, keeping 1 st at each side in garter st throughout. When the work measures 52-54-56 cm [20.5" - 21.25" - 22"], bind off for armholes at each side every other row: 2 sts 2-3-4 times, 1 st 4-4-3 times = 42-43-44 sts. When the work measures 65-68-71 cm [25-5/8" - 26.75" - 28"] , put the center 16-17-18 sts on a st holder for the neck. Bind off at each neck edge every other row: 2 sts 2 times, 1 st 2 times = 7-7-7 sts remain on each shoulder. Bind off with double yarn when the work measures 72-75-78 cm [28.25" - 29.5" - 30.75"]. Back: Cast on and knit as for the front. Bind off for armholes as on the front = 42-43-44 sts. Continue knitting until the work measures 71-74-77 cm [28" - 29-1/8" - 30.25"] then put the center 26-27-28 sts on a st holder for the neck. Dec 1 st at each neck edge on the next row = 7-7-7 sts remain on each shoulder. Bind off with double yarn when the work measures 72-75-78 cm [28.25" - 29.5" - 30.75"]. Sleeve: Cast on 26-27-28 sts with 2 strands Alpaca Bouclé. 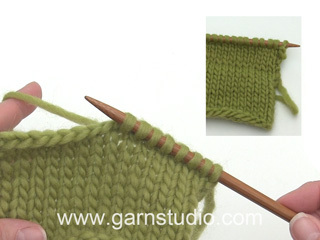 Knit 4 rows garter st, then change to stockinette st, keeping 1 st at each edge in garter st throughout. When the work measures 9-9-9 cm [3.5"], inc 1 st at each side 7-7-8 times every 5-5-4 cm [2" - 2" - 1.5"] = 40-41-44 sts. When the work measures 46-44-43 cm [18-1/8" -17.25" - 16-7/8"], bind off at each side for sleeve cap every other row: 2 sts 2-2-2 times, 1 st 5-8-8 times, then 2 sts at each side until the work measures approx. 57-57-57 cm [22.5"]. Bind off. Assembly: Sew the shoulder seams. Sew in the sleeves and sew sleeve and side seam in one, using the edge sts as a seam allowance. 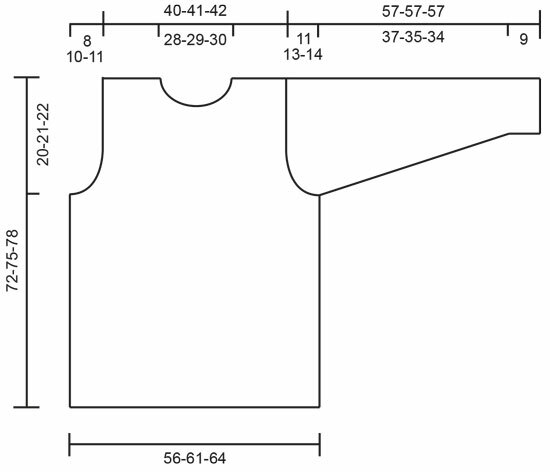 Collar: Knit the collar back and forth on the needles from the left shoulder seam - pick up sts so that there are 6 cm [2-3/8"] of overlap on the left shoulder (3 cm [1.25"] at each side of the shoulder seam). Pick up approx. 70-80 sts around the neck on double pointed needles with Big Bouclé (including sts from the st holders). Knit stockinette st, keeping 1 st in garter st at each side. When the collar measures 16-17-18 cm [6.25" - 6.75" - 7"], knit 2 rows garter st over all sts, bind off with double yarn. Crochet: With 2 strands Muskat and 2 strands Cotton Viscose (= 4 strands), work 1 row of reverse single crochet around the sleeves and around the collar. Hi! I use 2 strands of Alpaca Boucle with 6mm needles but i get 7.5cm/10sts stockinette st instead of 10cm/10sts. How is this possible and what should i do? Dear Vasso, everyone knits somewhat differently, and the result might be somewhat different gauge as well. 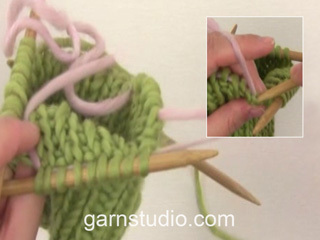 If you are getting fewer stitches, it means you knit too thightly. Try using bigger needles. Happy knitting! Dear Mrs Kiely, 1 strand Alpaca Bouclé - in 2nd size you would need 550 g Alpaca Bouclé working with 2 strands = 1540 m (11 balls x 140 m). Read more about alternatives here. Happy knitting! Bonjour Mme Marmoiton, vous avez mis en attente pour l'encolure: les 16-17-18 m du milieu devant et les 26-27-28 m du milieu dos. Pour tricoter le col, commencez à l'épaule gauche, 3 cm avant la couture et relevez les mailles tout autour de l'encolure, puis quand vous arrivez aux premières mailles relevées, continuez encore sur 6 cm (vous arrêtez 3 cm après la couture d'épaule). Ce chevauchement de 6 cm va permettre de donner un beau retombé au col. Bon tricot! Hi Please can you tell me which side is supposed to be the right side. I think the picture looks like the pearl side? 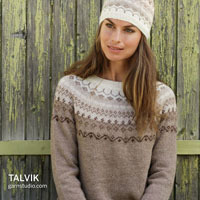 Dear Bev, the sweater is knitted with stockinett stitch, with its knit side as the right side. The modell uses a bit of rustic, uneven looking boucle yarn that gives the appearance of having the purl side out. 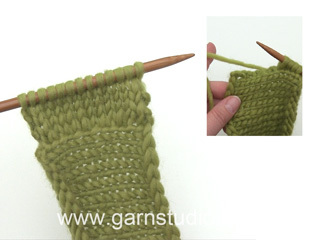 However, why don't you knit a swatch and see which side you prefer and use that as a RS in your piece? Happy Knitting! Hallo Valerie, Dit is een wat ouder patroon, waarvan inderdaad een aantal garensoorten uit de handel zijn. Welke kleur precies geschikt is als vervanging in combinatie met nader garen, kun je denk ik het beste even bekijken bij je verkooppunt. Hallo Karin, Inderdaad asymmetrisch; de col wordt vanaf de linker schouder heen en weer gebreid, dus bij de linker schouder is de col open en bij der echter schouder dicht. Ik ben benieuwd naar de col van deze trui, maar kan die niet goed zien vanwege de positie van het model op de foto. Hoe ziet de col er op de andere schouder uit? Bonjour Nathalie, commencez à relever les mailles du col 3 cm avant la couture d'épaule gauche (= le long du dos), continuez à relever les mailles tout autour de l'encolure, puis relever ensuite des mailles encore pendant 6 cm, derrière celles que vous avez relevé au début du tour, vous aurez ainsi un chevauchement total de 6 cm, soit 3 cm avant l'épaule et 3 cm après l'épaule. Bon tricot! In der Anleitung zu "Island Girl" ist als Material-Alternative DROPS Alpaca Bouclé von Garnstudio 500-550-600 g Farbe Nr. 0100, natur genannt, wobei mit 2 Fäden Alpaca Bouclé gestrickt werden soll. Reicht dann die angegebene Menge von 500-600 g aus? Liebe Frau Lacey, 2 Faden Garngruppe C (= Alpaca Bouclé) = 1 Faden Garngruppe E (= Big Bouclé), so daß man die Lauflänge kalkulieren muss - siehe auch hier. Viel Spaß beim stricken!